The 2017 Buick Regal will actually be sold as either a hatchback sedan or as a wagon. GM was serious. It’s beautiful. It’s gorgeous. It has optional all-wheel-drive. It is the blessed Buick of the long-forgotten myths and legends, here to remind us it is not a Buick. Man oh man, let’s talk about the wagon. The heckin’ Regal wagon! 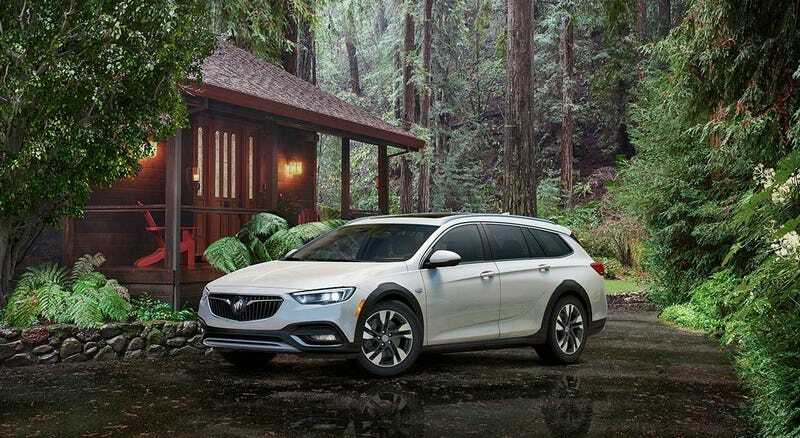 It’s already been labeled as a “true crossover” and also as a “station wagon,” (and revealed at a GM party earlier today), and it does adopt that slightly silly “tough” grey cladding around the wheels like some other wagons on the market, but it’s definitely a Buick Regal wagon! And it is pretty. Called the Regal TourX, the wagon is 0.6 inches taller that he Regal hatchback, which is officially dubbed the Regal Sportback. Both the TourX and Sportback models get the same turbocharged 2.0-liter four-cylinder engine with 250 horsepower. The front-wheel-drive Sportback option gets 260 lb-ft of torque while the all-wheel-drive models get 295 lb-ft, which is standard on the TourX and optional on the Sportback. The front-wheel-drive Sportback gets a 9-speed automatic transmission, while the rest of the lineup is stuck with an 8-speed. The Regal Sportback is claimed to be 200 pounds lighter than the outgoing Regal, and comes with a wave of new features. The most impressive feature is a new pedestrian-protection system that can detect an impact with a person at speeds between 16 and 30 mph. If an impact is detected, the hood pops up four inches to help cushion the blow of you hitting somebody, so that’s nice. A seven-inch infotainment screen with Android Auto or Apple CarPlay is standard, and an eight-inch is optional. If you’re shopping for a Subaru Outback, Golf Alltrack, or heck!, even an BMW 3 Series or Volvo V60, go ahead and take a patient gander at the new pretty Buick Regal. Pricing will be announced later this year.